The best coffeehouse in town is on your countertop with the Ninja Coffee Bar brewer. 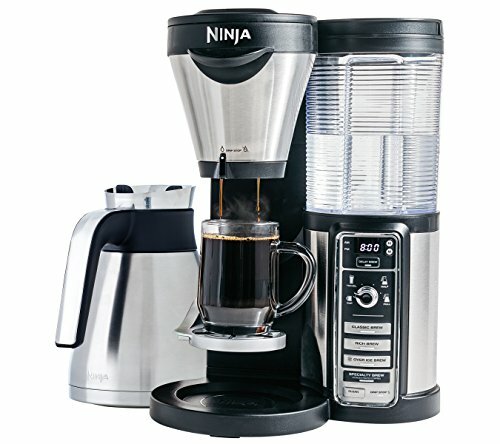 Ninja's patent-pending brewing technology is designed to deliver better, richer- tasting coffee with variable richness levels that are never bitter. Only the Ninja Coffee Bar brewer has Thermal Flavor Extraction, which truly unlocks the full flavor potential of your coffee.Only Ninja Auto-iQ One-Touch Intelligence allows you to CHOOSE A SIZE, CHOOSE A BREW.Auto-iQ One Touch Intelligence draws just the right amount of water needed from the reservoir, based on the brew size you choose (cup, travel mug, half carafe, or carafe) and brew type you select. CHOOSE A SIZE - Brew directly into your favorite cup, travel mug or make a half carafe or full carafe.CHOOSE A BREW - At the touch of the brew button, Thermal Flavor Extraction enables you to dial up flavor richness from Classic Brew to Rich Brew to Over Ice Brew in the size you want. You can also select Concentrated Coffee for hot and frozen blended specialty coffeehouse style drinks.The 43 oz. Stainless Steel Carafe is perfect for entertaining. The Ninja Easy Frother froths milk for specialty coffeehouse-style drinks. Also included are a 40 recipe book and a reusable permanent filter. 43 oz. Stainless Double-Wall Thermally Insulated Carafe, traps in the fresh coffee flavor and keeps your coffee hot for up to 2 hours without a warming plate. Please Note: Kindly refer the User Guide before use.